This monoclonal p53 antibody recognizes both wild type and mutant forms of human p53 protein. The epitope has been mapped to amino acids 46-55 of human p53. Due to low sequence homology with the epitope, we do not expect ab28 to react with mouse and rat samples so cannot guarantee reactivity in these species. Please note that the following publications suggest that the PAb 1801 clone also cross reacts with an unknown component of processing bodies (P-bodies) (PMID: 11313875; PMCID: PMC3349707). Please ensure that appropriate controls (e.g. MW ladder, treatment to induce p53 expression) are included to ensure the positive signal is from p53. Fusion protein corresponding to Human p53 (N terminal). 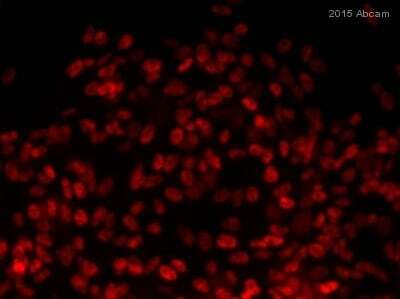 WB: A431 cell lysate, MDA-MB-231 cell lysate. 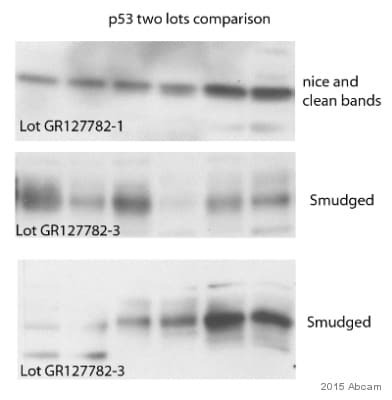 This monoclonal p53 antibody has been knockout validated in Western blot. The expected band for p53 was observed in HCT116 cells treated with irinotecan and the band was not seen in TP53 knockout HCT116 cell lysate. 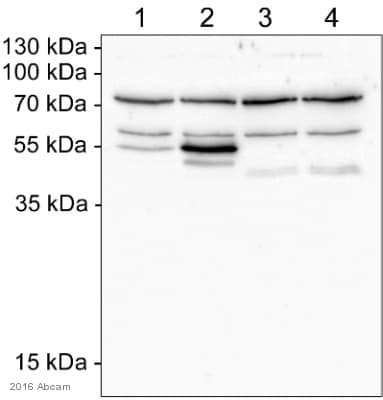 For Western blot, we recommend using 3% milk as the blocking agent. 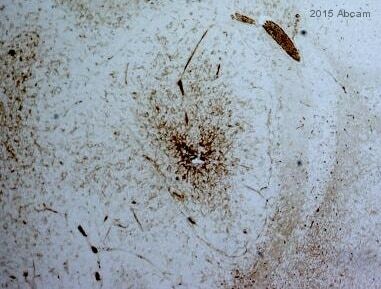 We recommend using ab1101 or ab154036, alternative mouse monoclonal antibodies, to detect human p53 by IHC, ICC/IF or flow cytometry since they perform better in these applications. Our Abpromise guarantee covers the use of ab28 in the following tested applications. Use at an assay dependent concentration. WB Use a concentration of 5 µg/ml. Detects a band of approximately 53 kDa (predicted molecular weight: 53 kDa). IP Use at 10 µg/mg of lysate. Lanes 1-9: Merged (red and green) signal. Ab28 was shown to specifically react with p53 in wild-type HAP1 and HCT116 cells treated with irinotecan. No band was observed in p53 knockout HAP1 or HCT116 cells. Wild-type and p53 knockout samples, positive and negative controls were subjected to SDS-PAGE. Ab28 and ab181602(loading control to GAPDH) were diluted 5 μg/mL and 1/10,000 respectively and incubated overnight at 4°C. Blots were developed with goat anti-rabbit IgG (H + L) and goat anti-mouse IgG (H + L) secondary antibodies at 1/10,000 dilution for 1 h at room temperature before imaging. Additional bands at: 53 kDa, 60 kDa. We are unsure as to the identity of these extra bands. 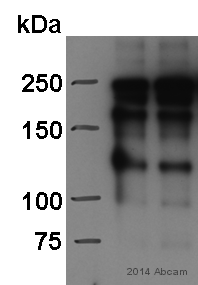 This blot was produced using a 10% Bis-tris gel under the MOPS buffer system. The gel was run at 200V for 50 minutes before being transferred onto a Nitrocellulose membrane at 30V for 70 minutes. The membrane was then blocked for an hour using 3% Milk before being incubated with ab28 overnight at 4°C. Antibody binding was detected using an anti-mouse antibody conjugated to HRP, and visualised using ECL development solution. Analysis of recombinant p53 protein (ab43615) in MCF7 cells treated with vehicle (VEH)as well as MCF7 cells treated with camptothecin (CAM) and no material (NO) by sandwich ELISA with the use of anti-53 antibody (ab28) as capture and anti-p53 antibody (ab32389) as detector. Lane 1 - 20ug of A549 lysate, lane 2 - 10ug of A549 lysate, lane 3 - 5ug of A549 lysate, lane 4 - 2.5ug of A549 lysate, lane 5 - 1.5ug of A549 lysate. This picture was submitted as part of the review by Craig Carson. Publishing research using ab28? Please let us know so that we can cite the reference in this datasheet. We have an item complaint. Please check attachment. What primary antibody concnetrations did you try? I look forward to your rpely and helping you resolve this issue. The antibody is covered under our Abpromise for six months and is guaranteed to work in western blot on rat and humansamples . If we cannot resolve the issue you are having with the antibody then I would be happy to either send a replacement antibody or to process a refund. The concentration for human tissue we tried 1:500, 1:800and 1:1000. For rat liver tissue we tried 1:1000. Your credit note ID is **********. At the moment I am trying to investigate the p53 activity in my cell line using the western blot technique. I am using a antibody for total p53 and a phospho-p53 (Ser15) antibody. I ordered those antibodies from a different company. However I am not completely happy with those antibodies. Therefore I am looking into ordering new antibodies. I was wondering which are the conditions you optimised your p53 antibody (ab26 or ab28) and phospho-p53 (Ser15) antibody (amount of protein needed, Blotiing solution and time, etc.)? How long would the shipping be taking? Ab28 and ab1431 can be used with a similar protocol, loading 20-40 ug mer lane, using a 5% milk block, and a primary antibody dilution of 1:1000. We will ship anywhere in the UK or US overnight for next day delivery. I hope this helps, please let me know if you need any additional information or assistance. Thank you for your inquiry. We have a number of antibodies in our catalog that might be of interest to you. I would like to direct you to the search facility on our website (www.abcam.com). Please enter the name of the protein into the search box at the top of the home page. A list of products will be generated which can be further refined using the filters on the left hand side of the page. Using these filters will help you to identify products that have been tested in the applications and species you are interested in. We have many BCl2 products in catalogue however I can recomend using ab18210 as it was tested in Immunohistochemistry on rat tissue sections. ab18210: https://www.abcam.com/Bcl2-antibody-ab18210.html The recomended p53 antibodies would be ab26; https://www.abcam.com/p53-antibody-P-ab26.html ab28; https://www.abcam.com/p53-antibody-P-ab28.html ab2433; https://www.abcam.com/p53-antibody-ab2433.html The recommended Ki67 antibodies are; ab66155; https://www.abcam.com/Ki67-antibody-ab66155.html ab16667; https://www.abcam.com/Ki67-antibody-SP6-Proliferation-Marker-ab16667.html We have region specific prices for the antibodies. The best way to know the price is by selecting the country of your origin displayed on top right corner of the datasheet. The system will automatically give you the price and shipping charges. Please be also advised that you would also need fluorophore or enzyme conjugated secondary antibodies. I have attached a protocol booklet where protocol of each application has been nicely explained including the ingredients required. Please go through it and decide which antibody and reagent you require. I hope this information is helpful to you. If you have specific questions about the products identified during the search, please do not hesitate to contact me.